iTunes | Spotify | Overcast | Pocket Casts | more! Can we use AI to help us find love? And at what point does this become creepy? We’re always talking about trust and transparency related to AI, but what about trust and transparency with humans and dating? 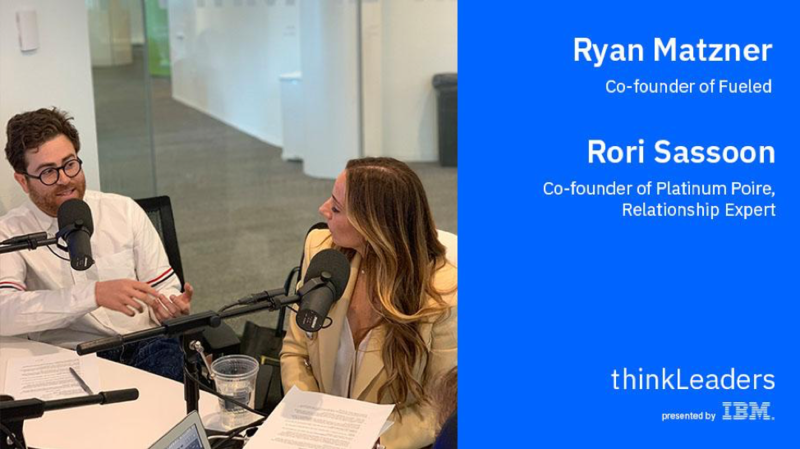 In this episode of thinkPod, we are joined by Rori Sassoon (co-founder of Platinum Poire and author of The Art of the Date) and Ryan Matzner (founder of Fueled). 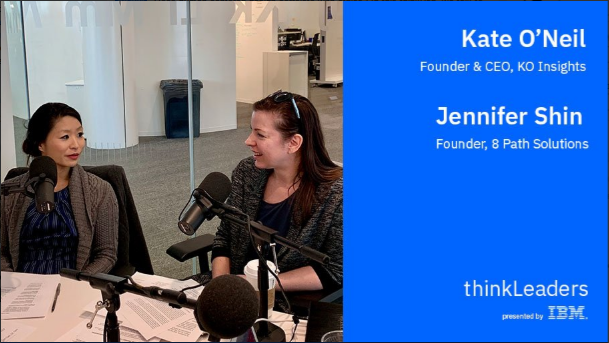 We discuss and debate whether AI is an effective and efficient matchmaker, how AI may be able to know us better than we do, the amount of data a dating platform needs, and the prospect of using visual recognition technology to find a match that looks like your favorite celebrity. -Is the concept of having technology help us find love, cool or creepy? -Will we have a fear in the future to ask people out, and if so, will AI nudge us towards offline connections? -How can we improve the data that goes into AI matchmaking tools? -Does the technology match how a lot of people are making decisions and so it’s okay to sort of push that forward with technology or is that inherently a flawed way to find love? As Fueled’s executive mover and shaker, Ryan Matzner leverages his digital marketing background, entrepreneurial tendencies, and acute eye for design to support a wide range of internal initiatives and client projects. Ryan built Fueled’s product, marketing, and business development teams from the ground up and continues to nurture them today. When he’s not captaining Fueled into the future of mobile, Ryan can be found dabbling in drone photography, fashion design, and providing The New York Times with ultra-niche commentary on the finer points of wood-burning fireplaces, fighting corporate waste, and adverse weather. Don’t forget to rate us on iTunes! Amanda: Hey everybody. Welcome to thinkpod. I’m Amanda Thurston. 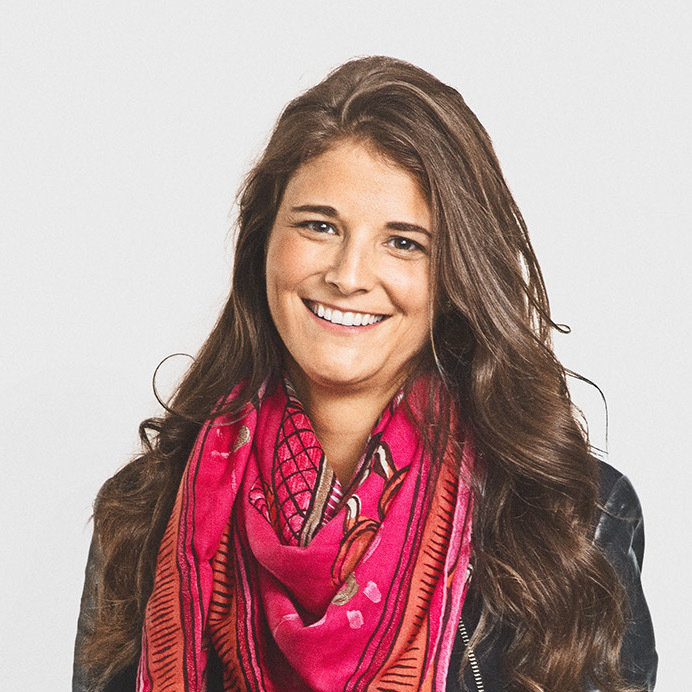 Amanda: And we are joined today by Rori Sassoon who was the cofounder of Platinum Poire and Ryan Matzner who is the cofounder of Fueled. We talk a little bit about how AI can help people find love. Caitlin: And if it’s creepy to have AI involved in picking that certain someone for you. Amanda: We brought up algorithms and how getting information on people is so challenging because let’s face it, a lot of people are really dishonest. Caitlin: Yeah, I mean we’re always talking about trust and transparency related to AI, but what about trust and transparency with humans and dating? Amanda: Yeah, I mean Ryan brought up this idea and at first I was a little bit afraid of it, but the more I think about it, he’s probably not wrong. That in order for it to really be effective and efficient for people, they need to open up all of the information about them, whether that’s their email or their text messages and the way that they engage with other humans and all their social media so that you can get a real picture of who they are within that dataset. Caitlin: So then it goes back to what Rori was saying though, so maybe it’s better with a matchmaker that it’s human, not AI to help you find that certain someone and I think ultimately you have to be open to both. Amanda: And they brought up personality and you know there are people that really need the three-factor authentication of being on a dating app and having that confidence that comes with knowing that somebody is swiping back to you as well. Caitlin: It’s interesting that Ryan brought up at the end that AI is not even tapping into all the possibilities of what it can do from a dating perspective. Amanda: I know they have a very different approach, but my key takeaway is that Rori and Ryan should definitely team up on a dating app because there would be something there. Caitlin: Really successful. Yeah, it would be a good one. Amanda: Hey everyone. We are joined today by Rori Sassoon who’s the cofounder of Platinum Poire, a relationship expert and has recently released a book called The Art of the Date, which is available on Amazon. There’s a little plug for you right off the bat. As well as Ryan Matzner who is the cofounder of Fueled. Welcome. Amanda: Thanks for being here. Rori: Thanks for having us. Amanda: So we’re going to talk a little bit about dating and AI today. Can Ai help us find love? I guess my first question is, is the concept of having technology help us find love, cool or creepy? I think we’ve all become very accustomed to dating apps and having technology at least facilitate our introductions to people. But would it be extra weird to have AI sort of foster our relationships? And I know there’s, for example, First Blush AI, which is a dating app that’s coming out that’s actually using AI to connect people. Rori: So I would say that I think that is just weird. I mean, I need human connection. That’s what we’re all looking for, that what we’re all starving for in this world is to be with a partner, to have love. Now I’m going to have an algorithm and someone like who’s not a human being, tell me and give me advice on my love life. Isn’t that freaky? Ryan: I think we use technology to make lots of things easier. Think about hailing a cab. You’re standing on this random street like hoping and waiting for a car to go by that is empty and ready to take you somewhere. And then you fast forward to the existence of like Lyft and you can just tell a car where you are and to come pick you up. So it’s just a better way of matching between a rider and a driver. And I think online dating and AI and other tools to aid matchmaking is pretty similar. It’s not about removing the human element, it’s about removing an inefficiency. Rori: I would say it depends also on the person and that I think is, not that I have a male/female opinion, but I do a little bit because a man just wants convenience. Like whatever is going to be easier. Where women are so different. Like as a woman I that would annoy me, you know, as to get an Uber. Yes, great click. It really doesn’t care how I feel. Rori: But with meeting the person who could be the love of my life, like we need to talk. Ryan: Well I don’t think AI is meant to sort of go straight from seeing your profile to getting married. It’s just a way to help facilitate those human connections. It’s still about meeting someone. It’s still about having a deep and meaningful connection with another human. It’s just what’s the precipitating moment for that introduction. Caitlin: So for me, dating online, which I’ve done is this very interesting, weird process but it’s been good, right? Like I have met boyfriends on it, there’s been real relationships. But I do sometimes think to myself with AI I’m like, I don’t want you to predetermine certain things, which I think is the ickiness factor sometimes of you could predetermine. And as I look at the future of where we’re going, I don’t want, when you look at algorithms to maybe remove certain guys from my dating pool because of a certain feature or Xyz, I don’t know what it is, but do you know what I’m saying? Ryan: Let’s look at some historical things for a second. Ryan: Why are cities such a place that people want to live? And that also result in lots of new ideas happening, experimentation and new businesses. Why do those happen in cities instead of other places? And it really comes down to density and the way that density results in increased opportunities for good things to happen by chance. So it’s a serendipity engine is what cities are. These things are all about enhancing serendipity, increasing chances, and then you look at kind of another historical thing like how people have met historically in other cultures, pre-technology. You have arranged marriages where you sort of have an agent that is, your parents generally or grandparents that are looking for a match for you. You have coming out balls, debutante balls where there are sort of a wide range of women that are presented to all of the men. So this idea of saying, okay like here are the opportunities, here are the options, let’s like figure out a way to pair. This is been something that’s worked well historically and now that we have new technologies, it’s just an iteration on that. So technology, AI, whatever it is as it relates to dating is really about maximizing efficient serendipity. Amanda: Yeah, I do think that it’s an interesting point that there is going to be a tool and if it’s more sophisticated, if we start to use the personality components of AI where you can actually understand how a person behaves and you can look at, I mean eHarmony, they do have successful relationships and they understand the data that went into that. And potentially as you get to see more and more of those successful relationships, you can start to map what that actually looks like algorithmically, and I’m not in the dating scene, but if I were, I would probably be happier if my dating platform were intelligent than if it were based on fewer criteria. Rori: I am not in the dating space, but I do deal with single people all day and all night because that’s what my company is. It’s a high end matchmaking service, but my service was really created for single successful people who do not have the time. Some people lack the skill set of finding the right partner. We personality profile; my partner’s a doctor. He’s also a forensic profiler. He, you know has that skill set as well and we really match you on the inside before the outside. Every single date that we send you on is going to make sense. If I end up on four or five or six dates, whatever it is, you can always come back and say, “You know what? This really made sense. This was everything that I’m looking for on paper. However, the chemistry is the chemistry.” That’s the only thing two people can determine. Not An algorithm, nothing. Amanda: One of the things that’s come up is a hurdle in dating apps is people’s willingness to actually ask someone out and that they still, even though there’s technology in between them, get nervous about actually asking someone out. I do wonder if there’s a market, and I’d love your thoughts on this, Rori, about how technology can help people if they don’t have access to someone who’s a professional like you, how they can actually leverage technology to help them overcome some of those fears around dating. Rori: Well, I think it’s also, like you said, if someone’s really shy, it is a little bit hiding behind the screen. Because you aren’t showing your true self when you’re on that date, you’re making that investment. It’s like if I was to introduce you to someone and it just as a friend, not as a business. I met my husband through introduction and it was someone who knew him and someone who knew me and was like, you know, I felt safe going on the deed. I knew there was accountability. I wasn’t worried. I mean I look at, you know, online dating as a woman and maybe Ryan is different for you. You’re a guy, but as also a safety factor. There’s more chance for lies and deceitfulness when you’re meeting someone through a screen. Amanda: So can we talk about that a little bit? Because you have a process through which you vet people in your business, right? How do you cut through the noise of making sure that when you’re working with somebody that they’re telling you the truth about themselves and that you know when you’re matching them with somebody that you have complete and very honest information about them? Rori: Well that is a great question and that’s why my partner like I said, is a forensic profiler. So there’s body language and a lot of times the people that come to us are recommended. So it’s word of mouth. And the truth is we really do a background check. We want to make sure they are who they say they are. And that’s why we charge what we charge because there’s a lot of work that goes into each person. Rori: Well, I think it’s also when you have a doctorate in anthropology and theology, you know, you know this study of human behavior, he can sit here, look into your eyes, tell you all about yourself. Rori: Right. And I have to say out of all the hundreds of people that we’ve interviewed, he’s never been wrong. So he knows is this someone that’s going to be, that is healthy in their space mentally to be able to be dating right now. Because if there’s not and they need some kind of therapy and some kind of help, then obviously we offer that as the service as well. And that’s more of his domain, not mine. Ryan: I think that the idea of a forensic profiler or have someone who can sort of read a person and decide who might be a good fit for them based on a reading of that person is kind of just a human scale, inefficient version of exactly what good AI could do and arguably is a worse version of what good AI can do. I think it’s pretty easy ultimately to just tell what works. If AI is able to match people up and pair them on dates and they’re happy in those relationships, then it works. Rori: Absolutely. Listen, AI or matchmaking, at the end of the day, you’re going to meet the person, right? That’s your goal. Rori: So you might as well be who you are upfront. A lot of my clients would say to me, Oh, you know, I’ve done the online dating thing. The person who shows up is not really who they say they are. I’m sick of this. I don’t have time for this nonsense. That’s why I’m here. Ryan: Well, that’s AI is actually really useful. Part of why people have that frustration. I’m going on dates with people that aren’t who they say they are or I didn’t like this person, it’s a waste of time, is because most people are pretty bad at doing their own matchmaking. Which without Ai, which sort of the way that online dating for the most part works today is, it’s not particularly intelligent, it’s getting better and better, but ultimately it’s a lot of just people deciding for themselves through they’re going to go on a date with. And so they’re doing their own matchmaking. They have their own heuristics. Like I have met friends that have been very unsuccessful with online dating and they explained to me how they have this like supposedly genius system where they ask one question of the people they match with and based on that answer they’re able to decide if it’s a match or not and if they should go on a date or not. And then they just keep being disappointed with the results of those dates. And it’s like these are bad questions right now. People are taking things into their own hands. So I think this whole discussion is what if we took it more out of the hands of people. You and your partner professional matchmakers, you are probably pretty good at asking the right questions and you’re probably pretty good at making decisions about who to pair up. And my argument simply that AI, the right AI can just do that at scale and probably eventually exceed the success rate that you and your partner have over time and that’s far superior to people just taking that into their own hands and being their own matchmakers with online dating. Caitlin: If it has the right data, right, it goes back to what the data is. Caitlin: People complain a lot of times about filling out tons and tons of questions and answers. Sometimes those questions make a better experience because of the data that you’re giving them versus maybe just post your photo. We’ll see what happens. Ryan: Or we’ll integrate with all of the texts. Right now your phone’s AI already has access to a lot of those things. Like ever noticed that a unique word that you’ve used and typed now suddenly becomes part of your phones auto correct. There’s that built in AI and we need to get more comfortable with the fact that like that AI exists and there are companies that are trying to figure out ways to do that in ways that humans that are skeptical are more comfortable with. Amanda: I think what’s interesting is that whether you’re an advocate of technology platforms for helping you find love or your wanting that more direct route, maybe through a matchmaker or something that’s a little bit more face to face, in either scenario, the user needs to be more honest. And as they’re more open and they share more information, if that’s all of their email metadata or that’s them being transparent about what they’re looking for and who they are as a person in an interview scenario or even on a date that in the long run they’re better off because that system is going to work better for them. Ryan: Lying and optimizing like you know, it’s the difference between like showing the worst photo of you and showing the best photo of you. Neither of those are lies, but also neither are all encompassing of who you are. So the idea is to sort of create a presentation of what you believe you are to other people. And then part of dating is figuring out if the way one person sees themselves as aligned with how another person sees them. Amanda: Okay. Can we talk about visual recognition for a minute? Amanda: I think what’s interesting is if you were to meet somebody in a traditional sense, there’s a physicality that comes to a love connection and Baidu has a lookalike feature that matches you with somebody who looks like your favorite celebrity. Right? So using visual recognition technology to start to say, this person looks like that person. I know Caitlin would definitely profile Tom Brady. [Laughter] So I guess my question to both of you is an especially to Rori, is that okay? Is it okay to live in a society where the first thing is totally about appearances and is in that case, does the technology match how a lot of people are making decisions and so it’s okay to sort of push that forward with technology or is that inherently kind of a flawed way to find love? Rori: I think it’s flawed. I think yes, people are visual. We’re all guilty of that. I think that, you know, when you’re swiping right or swiping left, like there’s some apps that I think are better than others. Like I know The League is a great app. They only give you three matches per day. There’s no swiping. Caitlin: I have a number of friends who have gotten married as a result of Tinder and the people that they married are not typically the men or women that they would seek out or be attracted to in a bar or that they had dated previously. So I think the visual recognition, while creepy in a lot of ways may provide different opportunities. Swiping right and left as I always say, dating’s a second full time job and my true belief, and like I’m exhausted by it, but swiping right or left again, my friends just do it sitting on the bus. And one of my best friends met her husband, she swiped him at the library because she was like too busy studying for her law exam and she ended up going out with him. He’s the complete opposite of what we would ever imagine her with. And I think it goes back to human behavior, right? And it’s this idea of you want an algorithm to be completely transparent. You need to understand why it’s making the decisions, but like we need humans to also be completely transparent in order to make the right decisions. Ryan: So with the idea of AI that could find that look like what you find attractive, I think that’s a natural thing that makes sense. So everyone wants to be with someone that they’re both physically attracted to and emotionally attracted to. So they’re just kind of multiple components to what makes for attraction. And in any scenario it’s extremely inefficient to say who am I an emotional match with then who am I also attracted to? So if you just reverse that order, let’s start with the people that I find physically attractive or in the realm of physically attractive, that narrows the pool more quickly and efficiently. And then deciding who are emotionally attracted to as well. Obviously you can become more physically attracted to someone, but generally they’re sort of a ceiling on that. Like you can only go so far from being not attracted to attracted to them. And the other thing that influences what people are attracted to in general is social norms. So things like what does society find attractive and that often comes down or in a big way comes down to celebrities and what is promoted socially as beautiful. The idea of saying, well, here’s an example of a beautiful person that I like, show me other beautiful people like them, makes a ton of sense. It’s just whatever the societal norm for beauty is, and then show me similar people available for me to date. That makes total sense. And it’s pretty closely related to that idea of, okay, let’s find people that you might be attracted to. Then secondarily, let’s find people that you’re an emotional connection with. And the third thing, we keep talking about like this inefficiency or the work of swiping, don’t forget that the business model of these tools is to create a certain amount of inefficiency so that they could charge you for efficiency. Ryan: So the same reason that a matchmaking service works because people are tired of online dating. The idea is how do I pay money to save time and effort, which is like the core model here. 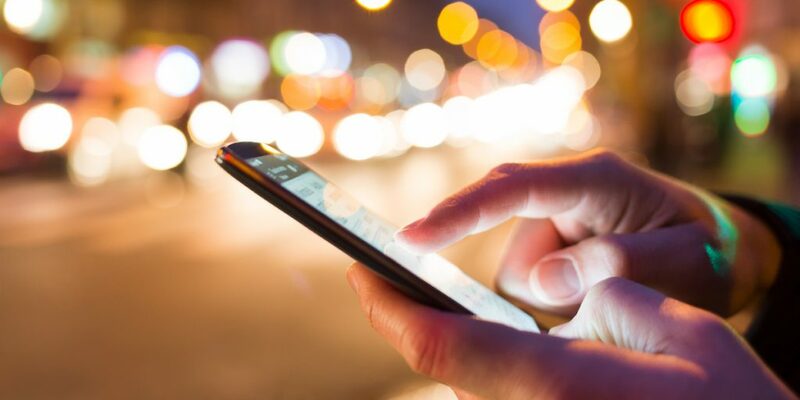 Some of the swiping is intended to be somewhat inefficient so that you’ll pay for the tools that all of these services have that allow you to swipe more efficiently. Amanda: Yeah, I think that’s an interesting point that a perfect algorithm and actually looking at AI and using it to really help people is sort of counterintuitive to the business model. Ryan: No, they’ll just have to charge more. Right now using an online dating app, most people probably have to go on many months or even years of dating through them, meeting multiple people, going on many dates to find the right person. So that’s relatively inefficient. And you’re paying like $9.99 a month for the most efficient version of those apps. And then if you sort of move into a more efficient realm where cool, this app can probably match you with someone in under six months that you’re going to fall in love with, then you’d be willing to pay a lot more than $9.99 a month. So I think that that pricing scales, and it’s still just as profitable. Rori: You know, I hear so many people come to me and say, oh, I’d feel like I’d been dating for years and I haven’t found the right person, or I’ve actually been in a relationship with the wrong person. It’s not even financially. It’s emotionally. I’m emotionally exhausted. I feel a little bit more bitter about what’s been going on. I’ve been completely duped by this person. They weren’t who they said they were. I mean, there’s so much of that, and I hear so much of that all the time. Ryan: But that has nothing to do with online dating. Ryan: That just has to do with bad matches. Ryan: People are bad at deciding who they’re matches with. Rori: A hundred percent, but at the end of the day, that’s how they met this person. There’s no accountability. How do I know where he came from? At least when you meet through someone that you know you, there’s accountability there. Caitlin: So that accountability though it goes to, is interesting because the stat from eharmony of 48% of online relationships and an email. If you meet somebody in person, right? If you connect me with somebody and I’m like, this guy’s not for me, I probably would be more inclined to say to him, thanks so much I’ve had a great time in person versus online. Right? With these different online dating apps, is that accountability gone? Rori: I think that accountability is completely gone. And when you meet someone and you had a date with them and these texts you and they said, “I had a great time, love to see you again.” Let’s say you don’t want to see them again. Wouldn’t you feel weird not to answer or just ghost them? You’d be like, thank you so much. I had a great time. I had just, you know, I didn’t feel the chemistry. Like I’d rather someone give it to me straight, be honest with me and let me go on with my life. Ryan: I think you’re right. I think online dating does enable a certain lack of a feeling for responsibility for the other people. It creates a layer of anonymity and distance. But I also think that’s not inherent to online dating. That’s just inherent to the current generation of online dating. And I think things like AI can also help improve that. This system starts to learn, okay, this is a bad actor, or this is a person that doesn’t go on many third or fourth dates. They’re ending things quickly. They’re indecisive. So I think good AI potentially could address some of those issues. And we also just on a technology level, haven’t figured out a good system for accountability yet. Rori: There’s no accountability. That’s a problem. Amanda: So I think coming out of this, we are going to have to start our own dating app that uses AI, right? Amanda: And you’ll kick people out if they don’t show up for dates. Amanda: Thanks for listening. We will be back out next Friday with another thinkpod. Caitlin: Adios. Have a killer weekend. See you next week. Amanda: Listen, find us on the Internet, all the places. Caitlin: Everywhere you’re at, we’re at. How human should a chatbot be? 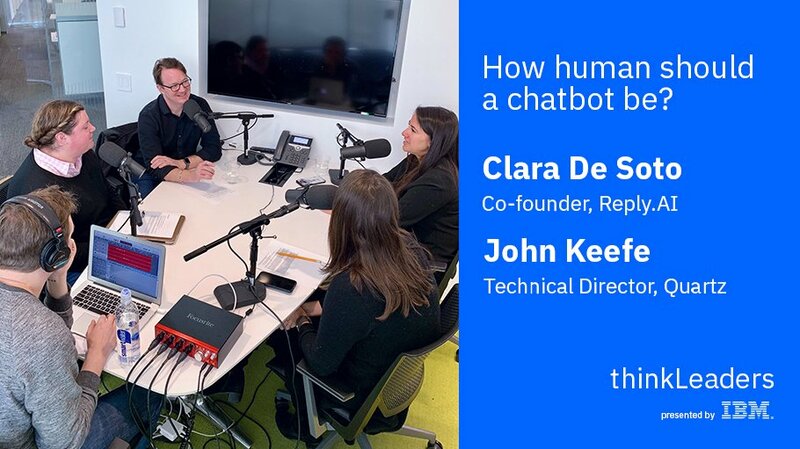 In this episode of thinkPod, we are joined by chatbot experts Clara de Soto and John Keefe. Clara is a serial entrepreneur and co-founder of Reply.ai, and John is the technical director for bots and machine learning at Quartz. When a brand thinks about implementing chatbots, one of the first conversations is usually about voice. What will this AI sound like? Will it be like a professional concierge, a chummy pal, or a quirky robot friend that admits up front that it’s a robot?